1. Massive pharma deal: CVS Health (CVS) is buying Aetna (AET) in the largest health insurance deal in history. The $69 billion acquisition -- $77 billion including debt -- would drastically remap the health care industry. CVS is a major drugstore chain and prescription drug insurer, while Aetna is one of the nation's largest health insurers. Buying Aetna puts CVS in a better position to compete with other integrated health care providers, such as UnitedHealthcare (UNH) and pharmacy benefits manager Optum. Aetna shares were higher ahead of the open. CVS shares were sharply lower. 2. Brexit crunch lunch: British Prime Minister Theresa May will meet European leaders Jean-Claude Juncker and Donald Tusk for lunch in Brussels. The meeting could be a crucial turning point in Brexit talks. May is hoping that the European Union will soon certify that "sufficient progress" has been made on three key issues: The Irish border, citizens' rights and a financial settlement. 3. Tax plan: The U.S. dollar has strengthened after the Senate passed a sweeping tax overhaul bill early on Saturday. Just one Republican, Bob Corker of Tennessee, voted against it on deficit concerns. However, the Senate bill differs from the tax bill passed by the House in mid-November. Those differences now must be reconciled and a final piece of legislation voted on by both chambers. Wall Street is betting that companies will use spare cash from the tax cuts to purchase boatloads of stock and beef up their dividends. European markets posted gains in early trade, while Asian markets ended the session mixed. The dollar added 0.3% against a basket of major currencies. U.S. crude oil futures dropped 1% to dip below $58 per barrel. The Dow Jones industrial average shed 0.2% on Friday, but still managed to add 2.9% over the week. It was the index's best week this year. 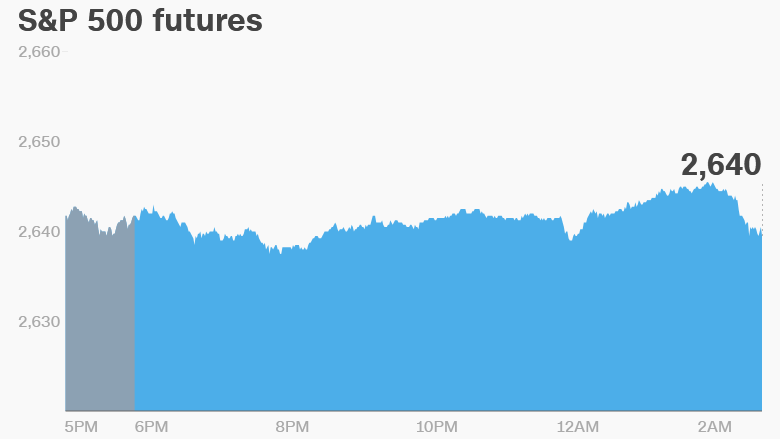 The S&P 500 and Nasdaq also posted losses on Friday. 5. Earnings and economics: U.S. factory orders data will be published at 10:00 a.m. ET.